INDIA intends to increase the share of nuclear power from 3.1 per cent of its total energy generation to 25 per cent by 2050. Six nuclear power reactors are under construction and eight are in the pipeline. While the country plans to expand mining of uranium to feed the reactors, a yet-to-be-released study by the environmental group Toxics Link pointed out that it lacked knowledge about handling nuclear waste; the existing uranium mines do not follow requisite safety methods. 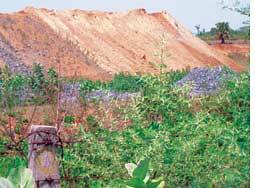 Most uranium is mined in Jadugoda in East Singhbum district and three other places in Jharkhand. The ore in Indian mines contains a low percentage (0.042-0.051 per cent) of the mineral, except in Meghalaya. The problem with low-grade ore is that extracting a small amount of concentrated uranium generates a large amount of waste. The ore grade is high in Meghalaya but an onslaught of rains makes the terrain almost inaccessible for six months in a year. The Uranium Corporation of India Limited (ucil) plans to invest about Rs 31 billion to set up new mines and processing plants in Jharkhand, Andhra Pradesh and Meghalaya as part of the eleventh plan. "The proposed mine at Kadapa in Andhra Pradesh involves extraction of 3,000 tonnes of uranium per day from underground mines spread over 879 hectares," said the study done from August to November. Quoting members of the non-profit Mines, Minerals and People, the study said for a uranium concentration of 0.039 per cent, the waste to be disposed of would amount to nearly a million tonnes per year. The waste rock generated by uranium mining contains a significant amount of radioactivity. "No inventory seems to have been maintained on how this radioactive waste is utilized and where it has gone," said Upasana Choudhry, the key researcher of the study. This waste was reportedly given to people for construction of houses and roads, but that has officially stopped now. Processing the ore generates slurry called tailings. In Jadugoda, waste ponds in which these tailings are dumped as well as tailing pipes that occasionally burst are occupational hazards. A tailing pipe burst on August 16, 2008, near the Dugridih village in Jadugoda, spewing it with uranium waste. Nuclear waste management practices in India are governed by the Atomic Energy Act 1962, which states that there should be no human settlement within five kilometres of a waste site or uranium tailing pond. "Even though Jadugoda has been in operation for more than 30 years, seven villages are within one-and-a-half kilometres of the danger zone. Dugridih begins just 40 metres away," it added. "ucil mines at Jadugoda makes use of a 'revolving door' contractor arrangement, whereby workers are dismissed as soon as they show signs of increased radiation doses," the study said, quoting the non-profit Jharkhandi Organisation Against Radiation. The organization works with tribals in the seven villages near the tailing pipes. According to a survey conducted in 1999 by the organization in the seven villages, 47 per cent of the women respondents reported disruptions in menstrual cycle, 18 per cent said they had suffered miscarriages or given birth to stillborn babies in the past five years, 30 per cent reported fertility problems and nearly all women complained of fatigue, weakness and depression. "The most visible impact of the mine has been deformed children," the survey said.